The 2014 AAU season concluded over the last five days, with many of the top teams from Ohio, Kentucky and other states heading to Louisville for the AAU National Championships and the AAU Super Showcase. Hundreds of college coaches were on hand for their third and final session of the summer, where they have near unlimited opportunities to evaluate some of the nation’s top young prospects. Triple Double Prospects was able to watch programs like All-Ohio, Ohio Varsity, Queen City Prophets, KY Hoop Dreams and the Kentucky Travelers impress college coaches, while the following players stood out in our eyes…. Elijah Pughsley – ’15 Lima Senior PG: When we look back at the players who had huge July’s, Pughsley’s name would have to belong near the top of the list. The former Cincinnati Hughes product, who will be back home in Lima next year, was electric for the Queen City Prophets, shooting the lights out from deep over the course of five days. Pughsley is not only one of the premiere shooters in the class of 2015 in Ohio, he’s also one of the state’s better competitors, and showed that in making big shot after big shot from deep for QCP. A hard-working all-around player, who can play either guard spot, Pughsley has already earned D1 offers from Western Carolina and Tennessee State, with more schools increasing their interest in him based on his performance in Louisville. Katwan Singleton – ’15 Defiance SF: Another Northwest Ohio native, Singleton was just as effective as his friend Pughsley, scoring in a variety of ways during multiple viewings, as he led his King James Runnin’ Rebels team deep into the Nationals. A skilled wing player at 6’5, Singleton is capable of driving strong to either hand to finish, can shoot it from deep and is crafty as a pull-up shooter off of the dribble. College coaches would still like to see him to focus on being aggressive a little more often, but he’s a very intriguing offensive talent who is continuing to improve. While Singleton does not have a D1 offer yet, he was tracked very closely by several programs, and could be receiving some new phone calls very soon. Alonzo Campbell – ’15 Gahanna Lincoln C: One of the state’s most quickly improving players, Campbell is a 6’10 center from the All-Ohio White team who might be the top “sleeper prospect” in Ohio in the 2015 class. Yes, he’s still very raw for a rising senior, but Campbell is a solid athlete with great length who can influence shots around the rim, moves his feet well enough to guard power forwards, runs the floor well and is getting better offensively. Also a strong academic prospect, Campbell is beginning to gather D1 interest at a high rate, and his recruitment is set to spike as he rejoins a talented frontline at Gahanna Lincoln next season. James Bolden – ’15 Covington Holmes PG: One of the best high school players in the Bluegrass State, “Beetle” will be one of the favorites for the Mr. Basketball Award in Kentucky next season thanks to his offensive ability and great speed. A commit for Bob Huggins and the West Virginia Mountaineers, Bolden was very efficient for the Kentucky Travelers with TDP watching, as the scoring point guard was able to make jumpers, set up teammates and generally speed up the pace of play. He’s definitely one of the thinner guards that will play at the high major level, but Bolden has a good mind for the game, is capable of scoring from anywhere on the floor and has elite speed to play in transition; making him an ideal fit for coaches who like smaller and speedy guards. Aric Holman – ’15 Owensboro PF: A very intriguing prospect out of Western Kentucky, Holman is a big 6’9 forward with great athleticism and upside. Having attracted offers from Kansas State, Western Kentucky, Oklahoma State, Memphis, Texas Tech, VCU, Auburn and others, Holman is a guy who college coaches are proving they’re willing to invest in. Playing with KY Hoop Dreams this past week, Holman showed serious potential as a face-up forward who is as comfortable playing on the wing as he is finishing around the rim. He’s a great floor-runner in transition, and if Holman can become a “high-motor” guy at the next level, he should be a very effective college player. 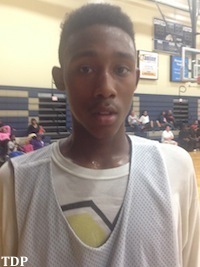 Frankie Hughes – ’16 Cleveland Garfield Heights SG: No 2016 wing player had a better July among Ohio kids than Hughes. The All-Ohio Red guard proved that he’s a great prospect at the next level as a big guard who can really pass the ball, is a smooth shooter from deep and is athletic enough to make some plays in transition. Hughes is still battling to become a more consistently effective player, but his talent level is extremely intriguing as a skilled guard at 6’4, maybe even a little taller. Kent State, Akron, Cleveland State and even Dayton have already extended offers Hughes’ way, look for this pattern to continue into the fall. Matt Moyer – ’16 Gahanna Lincoln PF: Offers have been coming in at a steady rate all month for the VCC Warriors forward, that continued in a major way in Louisville, as Florida, Vanderbilt and Northwestern joined the list of high majors to have sent an offer Moyer’s way. As well as his recruitment is going, Moyer is no so coincidentally matching that momentum on the court, as he was very impressive as a finisher and traffic rebounder for the VCC Warriors in a close loss to King James. At 6’8 Moyer can do some different things offensively to stretch the defense, but it his athleticism and upside as an above the rim finisher that really excites coaches. Heading into the high school season, if Moyer can continue his strong play he might just contend for being one of the top 2016’s in the Midwest. Nick Ward – ’16 Gahanna Lincoln C: Like his high school teammates, Campbell and Moyer, the rising junior, Ward, from All-Ohio Red was highly impressive in Louisville. A physical 6’8 post who is able to bully defenders to score around the rim with lefty hooks, Ward was one of the better interior scorers that we saw all week. His conditioning is still something that the big fella is working to improve, but Ward has the ability to be dominant with his strength, and has a very aggressive mentality which college coaches love. The junior center already has offers from Michigan State, Missouri, Kansas State, Dayton and Iowa State, Ward has seen his recruitment blow up in the last sixty days, something that should continue heading into next winter. Xavier Simpson – ’16 Lima Senior PG: While his King James Shooting Stars team did not end the summer the way they wanted to, losing to a very talented Baltimore Elite team in the semifinals (a team who would go on to defeat All-Ohio Red in the finals), Simpson was still highly efficient for his 16u team in several TDP viewings. The 5’10 point guard is the epitome of a floor general, is a dynamic defender on the perimeter and is apt as finishing his drives with soft-touch floaters. While only Xavier, Cleveland State and Toledo have offered Simpson so far, just about every mid or high major coach that TDP talked to was extremely interested in Simpson, as there’s always a premium in recruiting put on smart and tough point guards.